Arrange advanced helicopter heavy lift operations support in Colorado! FairLifts reserves skilled heavy lift helicopter support in Colorado, ensuring qualified helicopter assistance for an assortment of heavy lift operations. We deliver access to affordable and proficient heavy lift helicopter solutions for HVAC lifts, tower and antenna construction, advertising sign placement, hard to reach / remote areas, and delivery of construction supplies. FairLifts also arranges backup helicopter service for heavy lift operations, delivering vital support to construction, manufacturing, utility, moving and advertising companies. Our trusted operators hold Type and Production Certificates for the aircraft they operate. 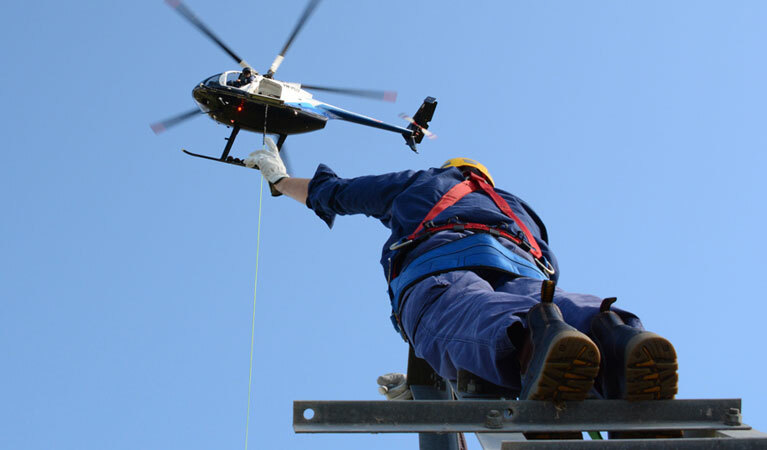 Helicopters transport are capable of carrying heavy loads connected to long cables or slings in order to affix heavy equipment in remote or inaccessible areas, such as the tops of buildings or the top of hills or mountains. FairLifts agents book helicopter support with vendors who provide air crane support for an array of heavy lift projects, including the precision placement of HVAC units, in remote or inaccessible areas, ensuring an affordable alternative to ground cranes. Other services include the construction and placement of towers and antennas for utility and telecommunication companies, advertising sign placement for media and advertising companies, transport of large loads to hard-to-reach or remote areas, and the delivery of construction supplies for development and construction firms in the state of Colorado. FairLifts collaborates with Colorado’s most proficient helicopter operators to schedule installation and maintenance support for tower and antenna construction. . A crew of experienced pilots provides knowledge in the design and installation of TV & Radio antennas, and in assisting riggers during tower and antenna installation for speed and safety. FairLifts arranges advanced sign, promotional and advertising placement guaranteeing exactness, maneuverability and skill. A crew of professional pilots delivers speed and care to ensure time-sensitive materials are correctly positioned quickly in isolated areas that are inaccessible by ground cranes. FairLifts reserves support for manufacturing and heating, ventilation, and air conditioning technology companies for the heavy lift and precision placement of HVAC units. Expert pilots and ground crew provide secure and timely heavy lift air crane service to remove and install HVAC units using precision long line, as well as heavy lifts to transport sizable HVAC equipment and supplies to keep construction or renovation projects on track. Our helicopter fleet can lift loads up to 4500 lbs., and large cargo areas supply ample room for pallets of supplies and gear to be loaded easily. FairLifts works with helicopter operators to manage effective heavy lifts for construction and delivery of supplies directly to the site. A crew of trained pilots offers cost-effective and ordered transport of items such as sand, concrete, building supplies, trees, poles, water tanks, and machinery. Our experienced account managers are standing by to deliver construction, manufacturing, utility, moving and advertising companies heavy lift project planning and provide quotes to ensure worthwhile solutions for essential aerial crane operations.